A cameo is a glyptograph or bas-relief carving, (the opposite of the technique used in intaglios) usually depicting a scene or portrait, for use in jewelry and decorative arts. When layered materials such as banded agate or shell are used, the foreground or lighter color usually depicts the scene and the background is created by exposing a deeper layer of another color. Cameos can also be monochrome and are carved from nearly every gem material including agate, quartz and corundum and many natural materials such as coral, shell, horn and ivory. Cameos have been created since Biblical times and were particularly popular at the end of the 18th and the entirety of the 19th century. A revival of cameo cutting in the late 1700s accompanied a period of classical decorative motifs and Grecian style fashions. The clamoring for cameos was so extensive that any and all materials were carved in an attempt to meet the high demand. 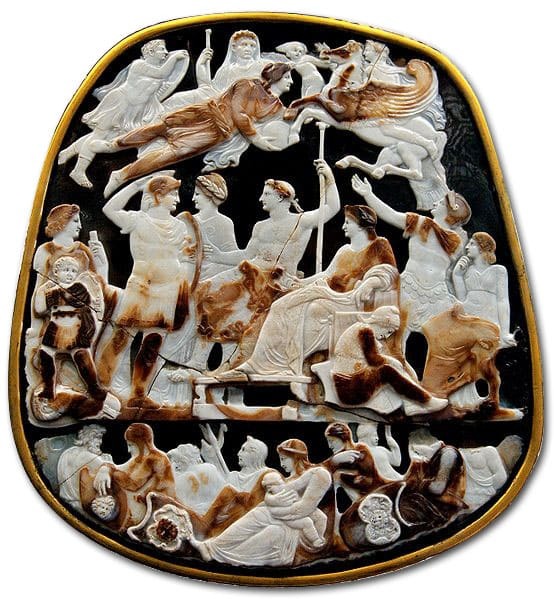 Shell cameos were the most successful alternative to the more expensive and difficult to carve gemstone cameos. 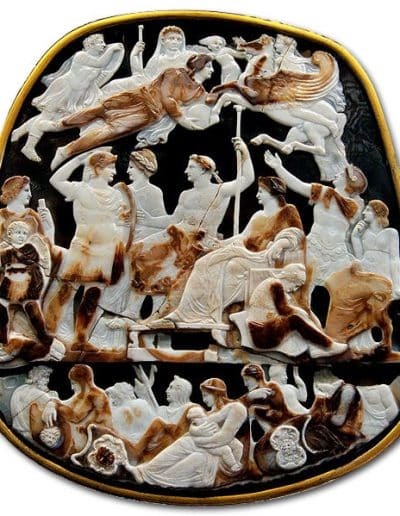 In addition, faux cameos were produced by cementing a lighter carving over a dark background including the jasperware cameos mass produced by Wedgwood. Collecting ancient cameos was also popular and these antiques were copied and even molded to provide inspiration for this new generation of cameo artists. Some of these antique collections became new works of art such as the Devonshire parure, Napolean’s “Crown of Charlemagne” and Empress Josephine’s cameo tiara.